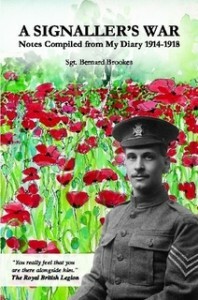 At the outbreak of WW1, my father, Bernard Brookes, then aged 21, joined the Queen’s Westminster Rifles. He kept a record of his experiences – including the 1914 Christmas Truce – in notebooks and later typed these up into a diary along with letters, postcards and other items that he collected during his time on the frontline. In 1984, the diary was bound in leather and exhibited at the Imperial War Museum. It has also been lent to the BBC. It has been a family project to publish the full text of his diary along with a selection of images, as a paperback and eBook. The result is a fascinating, first-hand account of what it was really like for a young soldier to serve in the trenches of the First World War.